The Lumix GH4 has become a very popular camera. Most of this is because of the 4K video feature at a reasonable price point. Some other bloggers are discovering the joys of using these 21st Century cameras that I have already known. Here in Part 1 of my user review I will explain some of the reasons why I like this camera. 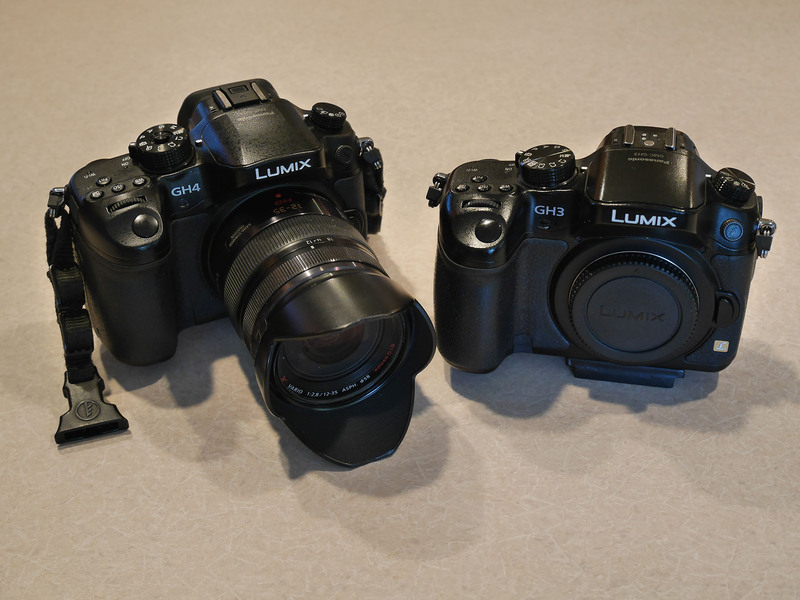 Even though they are very similar in many ways, the Lumix GH4 is a major improvement over the Lumix GH3. As regular readers of this blog will know I am a great fan of the GH3. For Panasonic to improve the camera is quite an accomplishment because the GH3 was already a great camera. The new camera would have to be considerably better for me to like it a lot more. It is. They look the same except for a small detail, locking mode dial. Inside Panasonic has changed the camera considerably. Because of this, I find it hard to pick up the GH3 anymore because of the GH4. Here are some of the reasons why. The viewfinder is miles better than its predecessor in the GH3. Not only is it sharper but it is easier to see without the edge Rainbow colors of the old viewfinder. I just don't like looking at the GH3’s viewfinder anymore. They even improved the eyecup. It is now softer and more comfortable. With the extra pixels in the viewfinder the image is a lot clearer. Sporting a new sensor with a faster read out, the image quality has improved in both stills and video. This faster sensor has improved the viewfinder as well. This is the first electronic viewfinder that I find looks almost like an optical view finder because of the faster readout and higher pixel count that adds to the clarity of the image. One thing that I have wiped about the GH series is the swivel LCD. Swivel LCDs were put on videocameras many years ago and I have always liked them. I am glad that Panasonic put them on all of the GH series cameras. They have improved over the years. By adding more pixels Panasonic has improved the clarity of the swivel LCD on the back of the new camera is much better than its predecessor. So much so that I could now use it as an auxiliary viewfinder with my HoodLoupe. Still there on the LCD is the wonderful touch control that worked so well on the GH3. I have always liked the touch focus. The new locking mode dial is very convenient in that when you push it down it locks the dial. Leave it up and the dial spins freely. This is a better arrangement than having to hold the button down to turn the dial like I'm some other cameras. I like being able to lock the mode to movie shooting. It is wonderful that the improvements that came with the GH3 are still there. Having dedicated buttons for white balance, ISO asked and exposure compensation is great. I use them all the time. Having so many other function buttons is great too. I have always liked cameras with two Control wheels. One for aperture control, the other for shutter speed. In Part 2 of my user review I will write about the improvements on the inside of the camera. Tagged GH4. Bookmark the permalink.